Conditions for Show/Hide form are not working properly. The conditions on this calculator are not working as they are supposed to. Whenever Parent Income is <$80,000, the text "Use strategies for category 1" should show." The only exception to this is when Non-Retirement assets are $60-$250,000 or >$250,000 then, "Use strategies for Category 2" should show. Whenver Parent Income is $80,000-$150,000, the text "use strategies for category 2" should show. Regardless of any other selection. 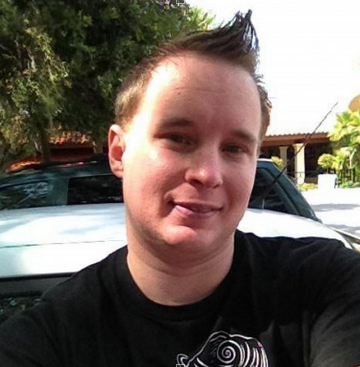 Whenever Parent Income is >$150,000, the text "use strategeis for cateogory 3" should show. Regardless of any other selection. I feel like I set up the conditions correctly, but the calculator is not working correctly. 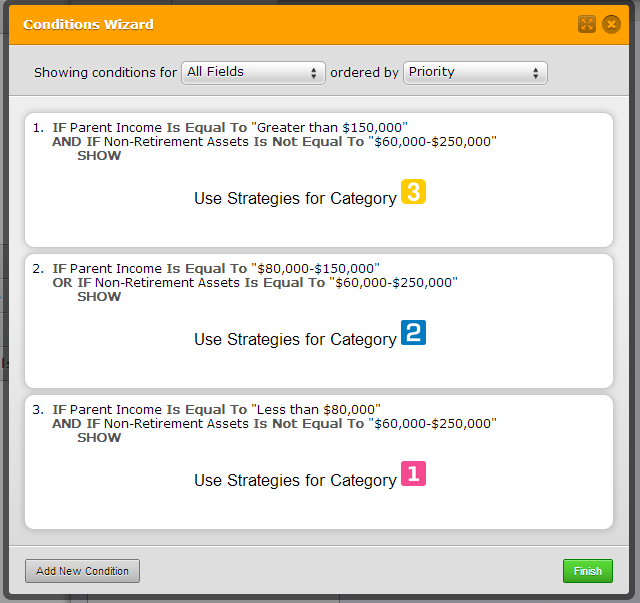 Additionally NO STRATEGY NUMBER should be showing until the use selects one of the Parent Income Values. You can apply the same condition to your form to achieve the "calculation" you need. Inform us if this is not how you wanted it. When parent income is <80,000 and non-retirement assets are >$250,000, text should be for "strategy 2". It is currently popping up strategy 1. When parent income is >$150,000 and non-retirement assets are $60,000-$250,000, text should be for "Strategy 3." It is currently popping up strategy 2. It seems that it's getting complicated to fix it. So I will dedicate some time during the day to get it fixed, and will get back to you later if I find a solution. Thank you so much. If you have other suggestions, I am open to that. You can clone it to use it and save all that work and also to check the changes I did. Kindly use this guide to know how: How to clone an existing form from a URL. When parent income was <80,000 and non-retirement assets are >$250,000, it was showing Category 1. The same was happening When parent income was >$150,000 and non-retirement assets were $60,000-$250,000. So, I needed to duplicate the field "Non-retirement assets" to avoid that conflict. 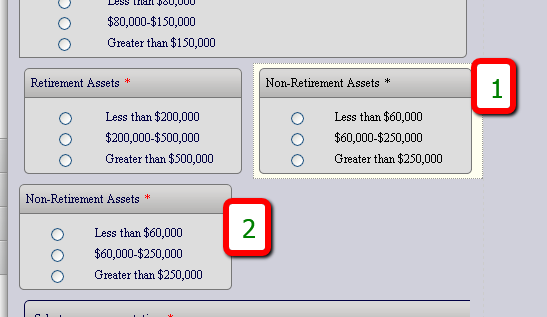 So that there are two "Non-retirement assets" fields. Number 2 will be hidden if "Greater than $150,000" in "Parent Income" is not chosen. However if it's chosen then it will show the Number 2 that was hidden and will hide the number 1 that was shown. I hope this helps, however if you need further assistance about this topic, don't hesitate to contact us. It is so close to being perfect!! However, when parent income is >$150,000 both strategies for 2 and 3 are popping up for all three answers on non-retirement assets, when it should only be strategy 3. Hi Kristy, I just checked and if I understand what you are saying it looks like either my colleague corrected this or it might've already been working as expected. I could see that when >$150k is chosen in the Parent Income Field then only Strategy #3 is appearing which seems to be what you are saying was not working to make it perfect beforehand. Please look at the copy of the modified form (https://www.jotform.com/form/32397825900964) he made for you in comparison to my screenshot below and let us know. This is still incorrect. Yes, you’re right, when Parent Income is >$150,000, then strategy 3 text should show. However, try completing the rest of the form. 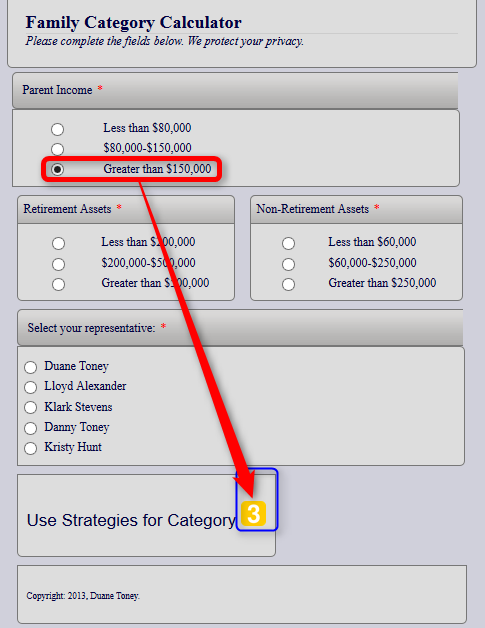 You will find that when you click on any button in Non-Retirement assets that Strategy 2 text also shows. Hmmm....okay thank you for pointing that out to me more Kristy. Well I've looked a second time now to test this on my end with the form where I found that I was not seeing any of this happen at all until I leave one of the Second Field Options selected Differently for the " Retirement Assets " then going back to change the first " Parent Income " Field which then seems to affect this and cause the condition problem to happen. Take a look at my test video of this below. I also found your previous thread with a issue related to this where my colleague Abajan responded to you with what looks like a similar yet slightly different form because it appears different. Did you try his version of your form ( http://www.jotformpro.com/form/32387654451964 ). I tested this some and I didn't come across the same issue with both options showing in that particular version. Unless there was something else wrong that I am still missing somewhere? Please let us know. The conditions are not working due to html codes on the field options. 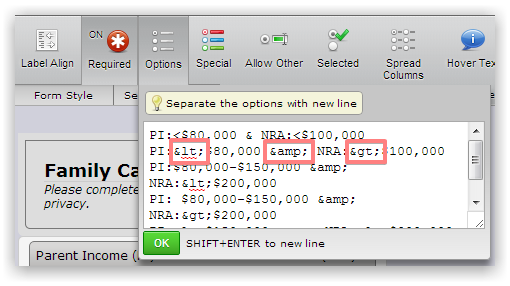 So html codes should be replaced with actual symbols < & and >. I am not sure about the conditional setup, but hope this is something that we can start with. Thank you. That is interesting. . . .where did you sub for those HTML codes? 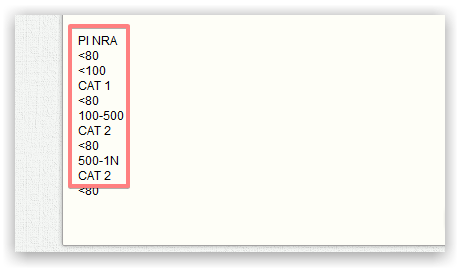 <80,000 and NRA >100.000 strategies for category 2 should show (currently showing 1). How do I clone your form to use? To clone the form please follow the steps in this guide: http://www.jotform.com/help/42-How-to-clone-an-existing-form-from-a-URL. Gosh, you guys make this complicated! It’s so frustrating for those of us who have no working knowledge of what on earth you’re talking about! That is my biggest complaint about JotForm. I love using it for it’s the way it integrates with so many things (I use it for two separate businesses), but gosh it would be easier if you guys could somehow make this easier for non-tech wizards. It’s also frustrating I can’t call you guys as so much is misinterpreted through these e-mails. I responded to this email asking how to clone the form. I KNOW how to clone the form, but the link I was sent was only a URL of the calculator, not an actual form on my JotForm ‘Forms’ site. So I had NO way to utilize it and get it into my system that I knew of. When someone clicks on this field, the button for Category 3 Families should pop up. We deeply apologize for the inconveniences this have been causing you. Also, let me apologize for any misunderstanding while trying to solve this issue. So let me explain how I have understood you want this form to work so that I can take this form for a second time to do my best to get it fixed. 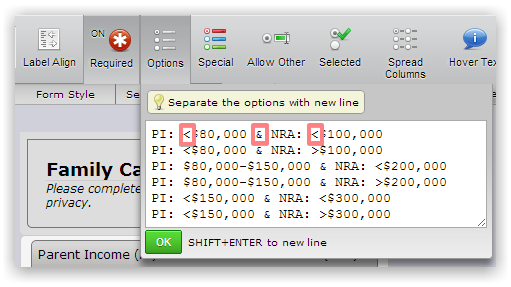 - If "PI" Is equal to "Less than $80,000" then Show "...Category 2"
- If "PI" Is equal to "Less than $80,000" and "NRA" Is equal to "$60-$250,000" or "$250,000" then Show "...Category 2"
- If "PI" Is equal to "$80,000-$150,000" then Show "...Category 2"
- If "PI" Is equal to "$150,000" then Show "...Category 3"
Or - If "PI" Is equal to "150,000" and "NRA" Is equal to "any of its 3 options" then Show "...Category 3"
- If "PI" Is equal to "300, 000" and "NRA" Is equal to "$1,000,000" then Show "...Category 3"
I hope I've understood well your requirement now. So I will dedicate time to this form so that I can get it fixed, I will do my best and will get back to you when I found a solution. Can you please check the following form? No, this is not correct at all. Just curious if you check it before you send it? The second selection should ONLY show category 2. Currently, it is showing 2 AND 3. The third selection should ONLY show category 2. Currently, it is showing 2 AND 3. The fourth selection should show category 2. Currently, it is showing 3. The fifth selection should show category 2. Currently, it is showing 3. The sixth selection should show category 2. Currently, it is showing 3. The seventh selection should show category 2. Currently, it is showing 3. The eight selection should show category 2. Currently, it is showing 3. The ninth through fifteenth selections are correct by showing only category 3. PI: >$250,001 & NRA: >$1,000,001 --this should show category 3. Hooray! It is wonderful! Thank you so much!